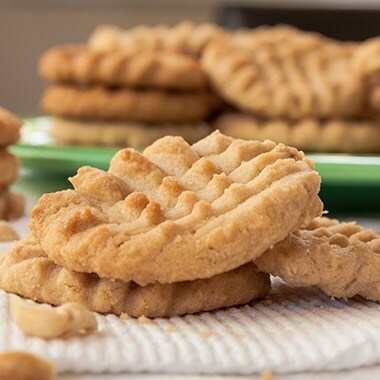 These deliciously nutty cookies use a generous amount of Maranatha® Peanut Butter and feature Sunspire® Peanut Butter Baking Chips for the ultimate peanut flavor. A guaranteed hit with peanut lovers everywhere! In a medium bowl combine, peanut butter, butter, sugar and vanilla. Add egg and mix thoroughly. Preheat oven to 375°. Scoop 2 tsp of dough and gently shape into a disk. Place on a cookie sheet, leaving a minimum of one inch between each cookie. Bake for 7-9 minutes until very pale golden brown. This will produce a lovely, light cookie that holds togther perfectly. Longer baking times will produce a darker and much more crumbly cookie because of the high peanut butter content. Allow cookies to cool for 10 minutes and transfer to a wire rack for additional cooling. Makes 3-4 dozen cookies.